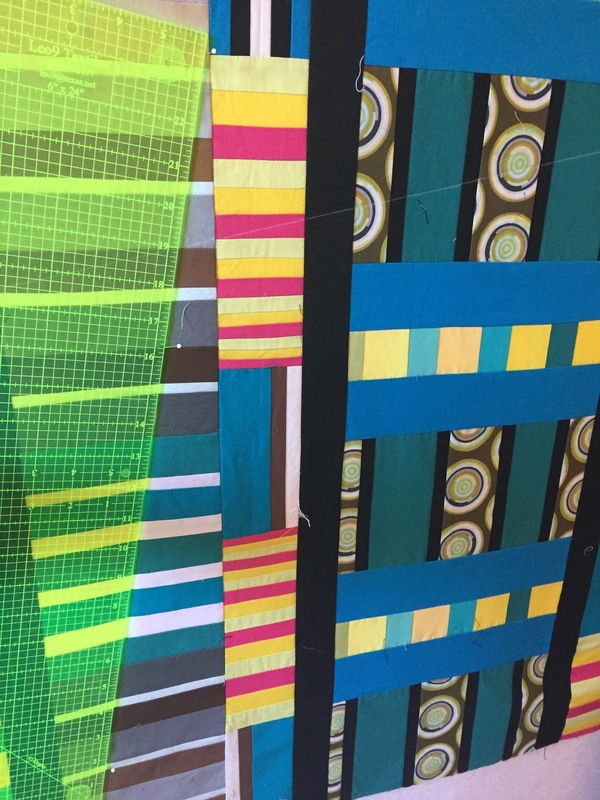 I pulled out the rest of my strip pieced fabrics from the Nancy Crow class in October. 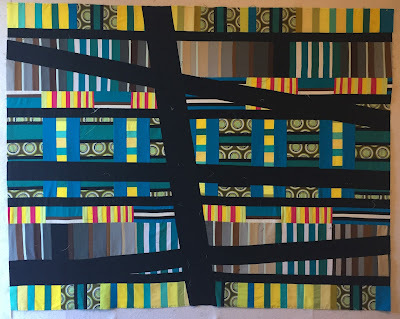 In an earlier blog, I showed the picture of the quilt top that I pieced in the class, then later ripped apart. 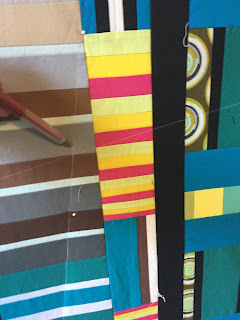 I used two of the strip sets to make Powerline quilts, which I also blogged about. 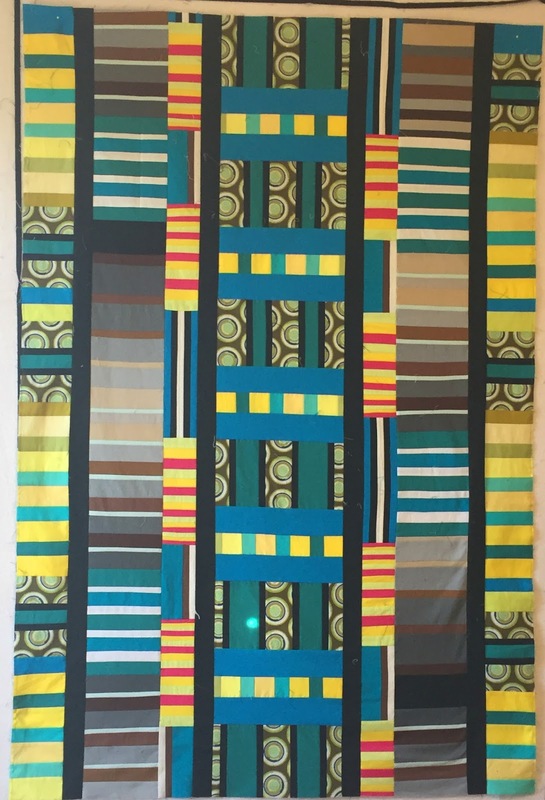 This quilt top is from some of the remaining strip sets. I modified the center piece to reduce the size of the vertical elements and I like this much better. They were originally 12" high and are now 5". I added 2" black strips to help contain the many seams from the strips and to give some places for the eye to rest. 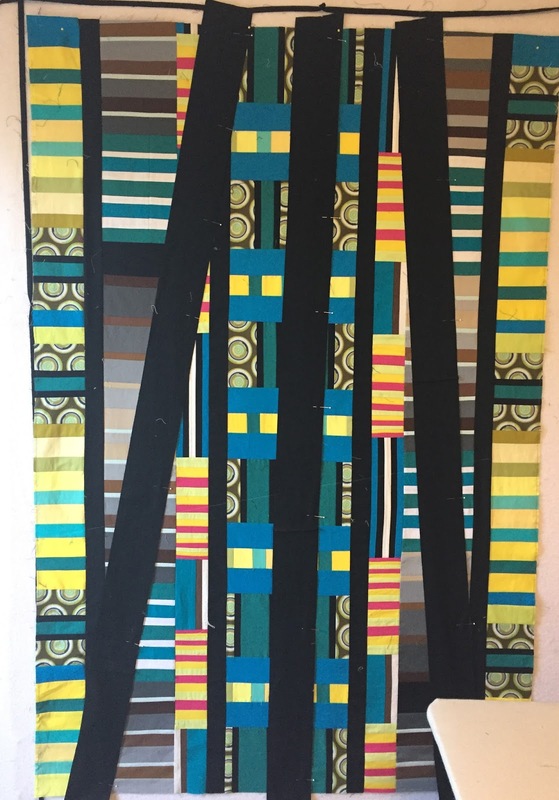 After I sewed this together, I auditioned a few more strips, but decided to end it where it was. 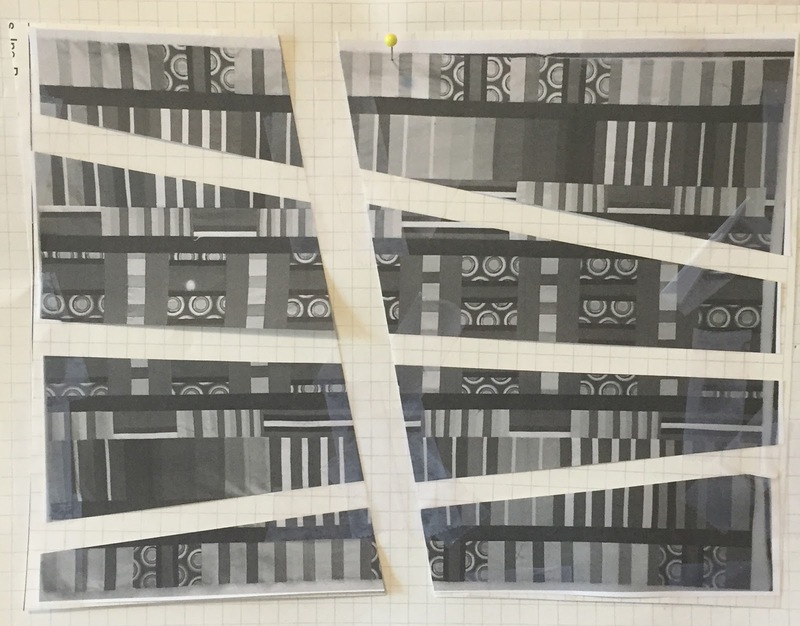 To help me continue with the design process, I printed a few black and white pictures. 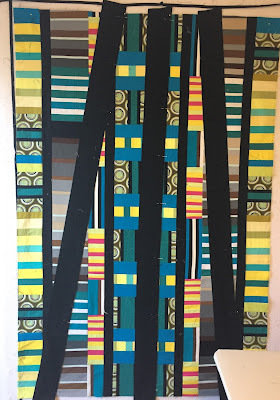 I considered cutting it apart and adding more black to make it less rigid and vertical, even though it was designed to be a vertical strip quilt. In the end, I went with the idea on the left. It gave me a feeling of the powerlines towering above the houses and vegetation below. 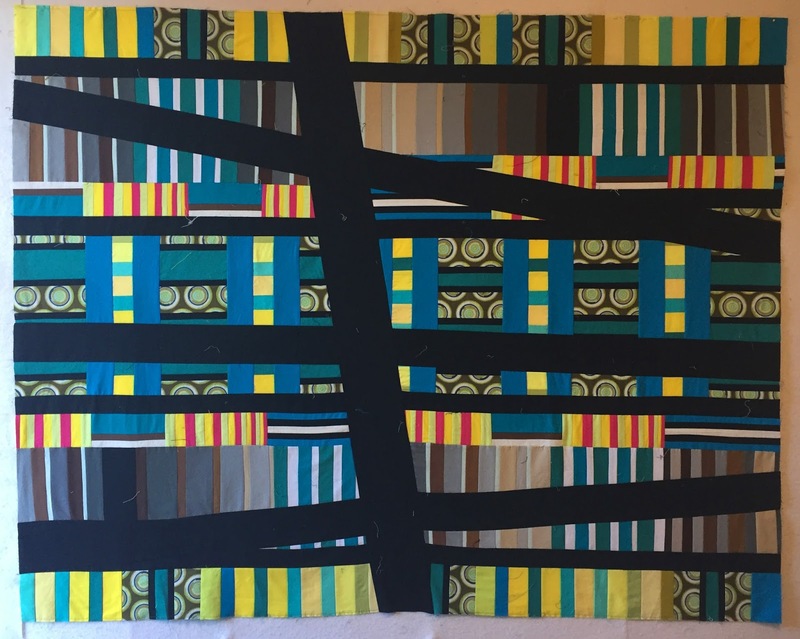 And it was the opposite of my previous powerline quilts, where the strips were pieced and the background was solid. 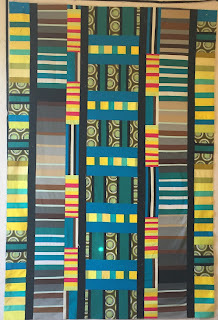 This one is solids against the strip pieced background. Not as minimal as the others, but fun, nonetheless. 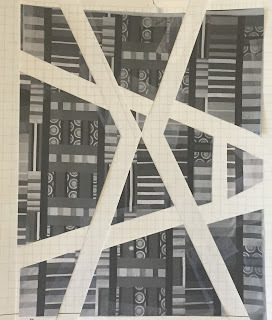 To insert the black lines, I first marked the location of the cuts with pins, using match marks from my photographs, then with a long ruler and a white chalk pencil. 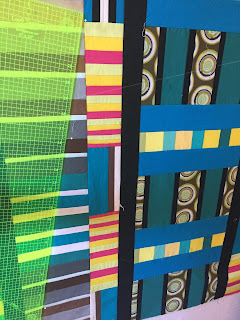 After the lines were marked, I positioned the smaller black strips against the background, abutting each against the chalk lines. A design wall is so helpful to get this done. I sewed these onto the top before cutting it apart because all of the seams and bias edges would create a nightmare if I didn't at least keep one edge in check. After sewing the seams, I cut the top along the chalk lines, matched up the other side, and sewed it in place. I pressed the top fairly well at this point. 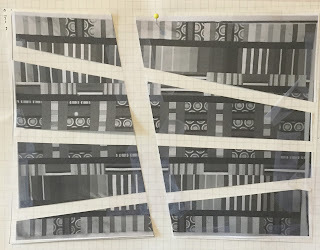 Then, I followed this process for the larger black insert. I knew that if I made this final cut and sewed the edges together that the vertical strips would not line up. So, I trimmed a section from the background. The insert piece was 5" cut size. So the amount cut out from the background was 1" less, or 4". Here is the completed top. 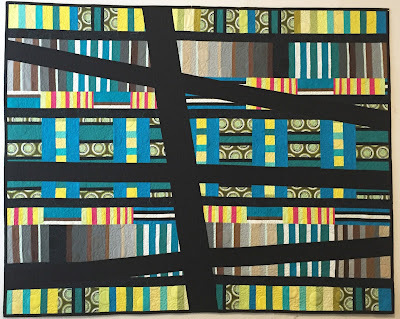 I decided to quilt this with two colors of thread and include circles to mimic the printed fabric. 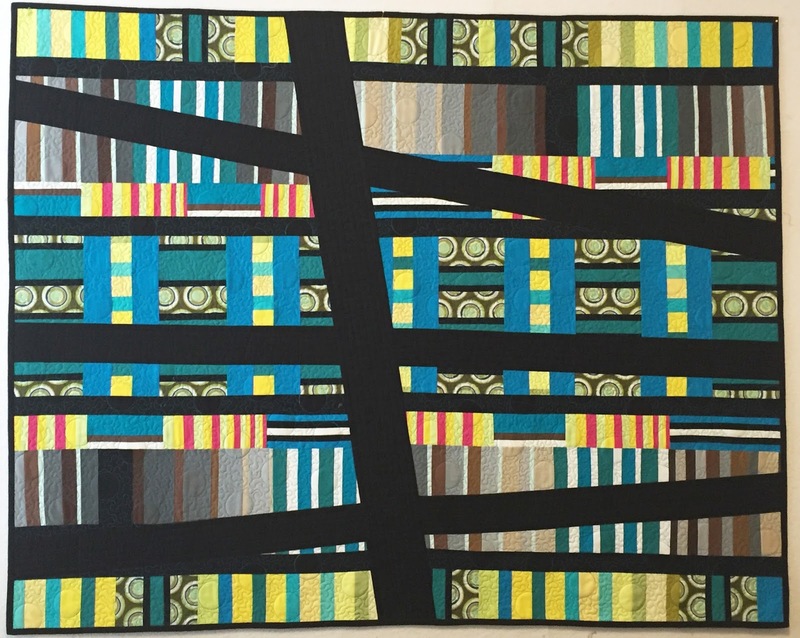 Here is the completed quilt. Your piece really does give you the perspective of being underneath the power lines. I love how the bit of red makes this quilt vibrate with energy. Well done!